The Church of the Holy Sepulchre is a church within the Christian Quarter of the Old City of Jerusalem, a few steps away from the Muristan. 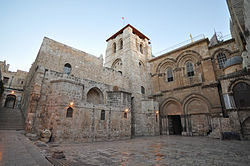 The church contains, according to traditions dating back at least to the fourth century, the two holiest sites in Christianity: the site where Jesus of Nazareth was crucified, known as "Calvary" in Latin and "Golgotha" in Greek, and Jesus's empty tomb, where he is said to have been buried and resurrected. The tomb is enclosed by the 18th-century shrine, called the Edicule (Aedicule). This article uses material from the Wikipedia article "Church of the Holy Sepulchre", which is released under the Creative Commons Attribution-Share-Alike 3.0 License.